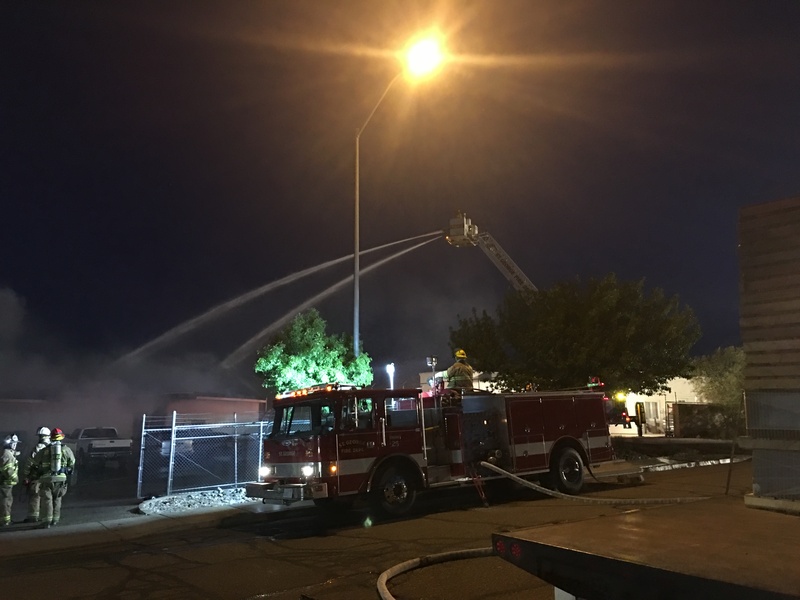 ST. GEORGE CITY – Even before the sun rose Monday morning, fire crews were responding to two fires. The St. George Fire Department first responded to a call at Albertsons located at 745 North Dixie Drive around 4:20 a.m. Crews were then dispatched about two to three minutes later to 1161 West 1240 North at the Frito Lay warehouse, St. George Fire Chief Robert Stoker said. An employee just getting to work at the warehouse called the fire in to dispatch, Stoker said. When fire crews arrived on scene, the fire was through the roof and traveling quickly. “Our main concern was containment to the building,” he said. At this point, authorities do not know what caused the fire but will be investigating as soon as they can enter the building. This is a developing story. Check back later for the latest update. St. George News reporter Tracie Sullivan contributed to this story. Mike Cole joined the St. George News video department in January 2016, bringing with him diverse experience in the field of videography and editing. Oh no! How are the chips? I’m with ladybug, Did the Frito’s survive?